After a wonderful weekend at Stratford’s River Festival we have now sold out of our Harvestshare 2015 juice. We also managed to give away 80 Act on Energy electricity monitors and spoke to lots of folk about energy saving, Transition, Time Bank and CEW grant giving. 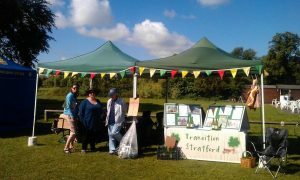 Keeping with our ethos of walking the walk we provided a bit of practical support to the River Festival’s attempts to get folk on site recycling with a collection point on the stall. We hope they continue with this in future years. To those that popped by to say hello – thanks, it was great to see you and to those that signed up to the mailing list – welcome and please keep an eye on your inbox for your first message from us in the next couple of days. To the small but very keen team who staffed the stall for the weekend – huge thanks, we can’t continue to spread the word and model change without your help. 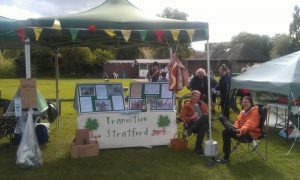 To find out more about how you can get involved please email us at admin@transitionstratford. This entry was posted in Uncategorized on July 4, 2016 by Tanya Butchers.